Hmmmm...wonder why it isn't working for me anymore. I did send an email to them telling them of my problem. Thanks. This is puzzling Larry. 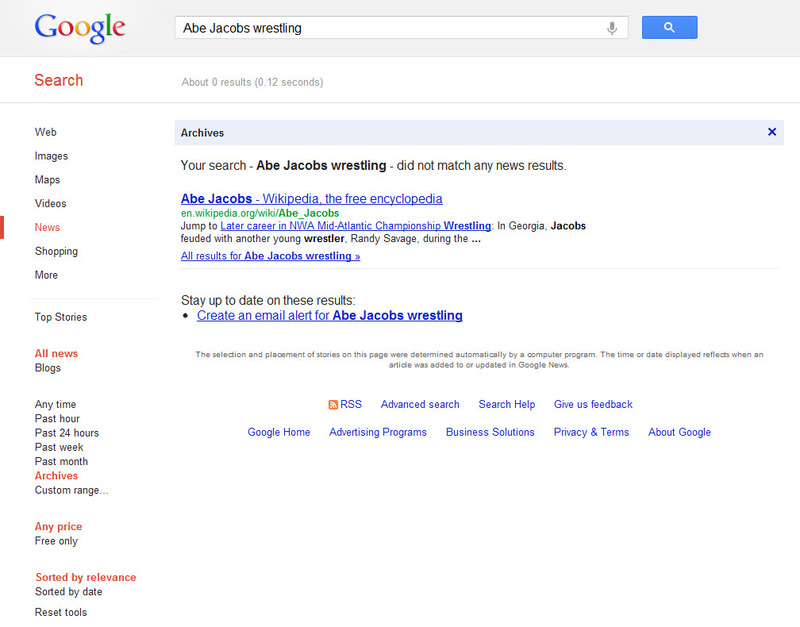 I just tried it again before making this reply.I entered "Abe Jacobs wrestling" and got 877 results from the archive. I just typed in "Abe Jacobs wrestling" and it came up "No Results". Would you mind posting the link that you use? Maybe the one I have isn't right or got corrupted somehow. I get "no results found" when doing exactly the same. Has been that way for me for nearly a year though. This is strange.I just clicked on the link in my post above and got the 877 results again. I don't know why it would not work for you. Sorry. This is getting even more bizarre the more I try it! I clicked on your link and first it was coming up "404 File Not Found". The I tried again and it started giving me the "No Results Found" message. Then I opened up Firefox to try it. Same results. I am currently using Google Chrome as my web browser. I will just wait to see if the email I sent to Google Support ever gets answered. Thanks for help though. Now, mysteriously Google New Archives Search is working properly again. Go figure. Not for me. Please let us know if you receive reply from Google. If I receive anything I will post it here. It has to be something on my home PC that is causing the problem. I tried the link at work, and everything was fine! I get home, try again, and back to "No Results Found". This is getting more and more bizarre as time goes by. In the search box, I typed in "wrestling Abe Jacobs" as CHall used in his try. It gave me the page he had with 877 results. Still don't know it went all wonky on me!